Hello everyone! The final weeks of school have started and it's been nothing but chaotic! This explains why I've been posting so little lately. The madness still continues for a couple of weeks but after that I hope to blog more often again, I've got plenty of fun stuff planned. So yes, I should be studying right now, but I just needed a break to show you these nails. :-) Holland has had great summer weather last week and I wore a bright yellow (Make-Up Studio M67) most of it. After two days I had a bit of tipwear, but I just couldn't take the happy yellow off yet. And the tipwear wasn't noticeable anyway because it's a light color, so I decided to keep it on and update it with a tribal pattern in shimmery blue. 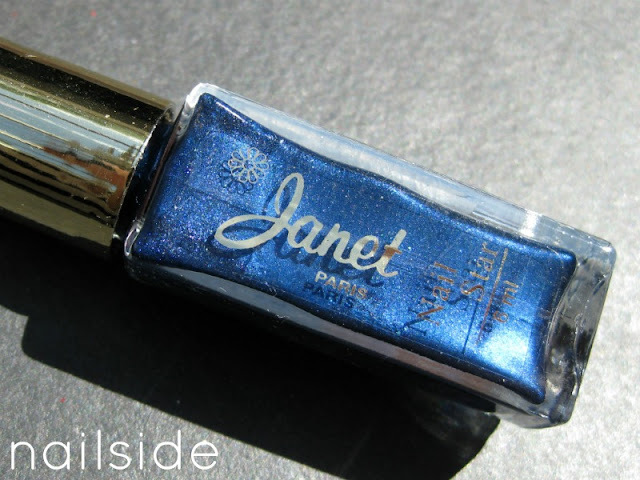 The striper polish I used for it is Janet #119. I kind of like the final result, very exotic. ^^ Chiquita, anyone? 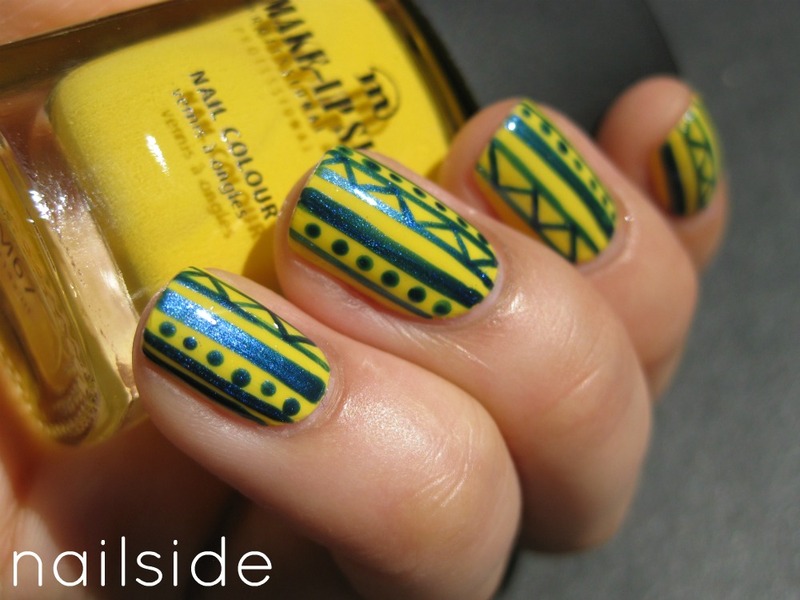 Je hebt gelijk, ik zie helemaal geen tipwear, je tribal mani ziet er erg goed uit hoor! Waar heb je die striper vandaan? Ik zoek nu al een tijdje naar goede stripers, maar de enige stripers die ik kan vinden zijn van de Douglas in speciale pakketjes, terwijl ik eigenlijk gewoon losse uit zou willen kiezen, dus ideeën? Hoi Sera, bedankt voor je reactie! :-) Deze striper heb ik gewoon van de markt, ze waren 3 voor 5 euro. In veel webshops kun je ook voor vrij voordelig stripers in alle kleuren afzonderlijk kopen, of goedkope setjes van Ebay. Ik zou gewoon zoeken op 'striper lakken' of 'striper polish', dan vind je sowieso een hoop aangeboden. Nice, but it is too much for me. pretty! you have such steady hands! What happy, bright mani! Totally fits the summer. Wow, that looks amazing :) How did you do it? another amazing tribal!! yay... another tribal, and you're the tribal queen!!! I love that yellow! It's so bright and fun. 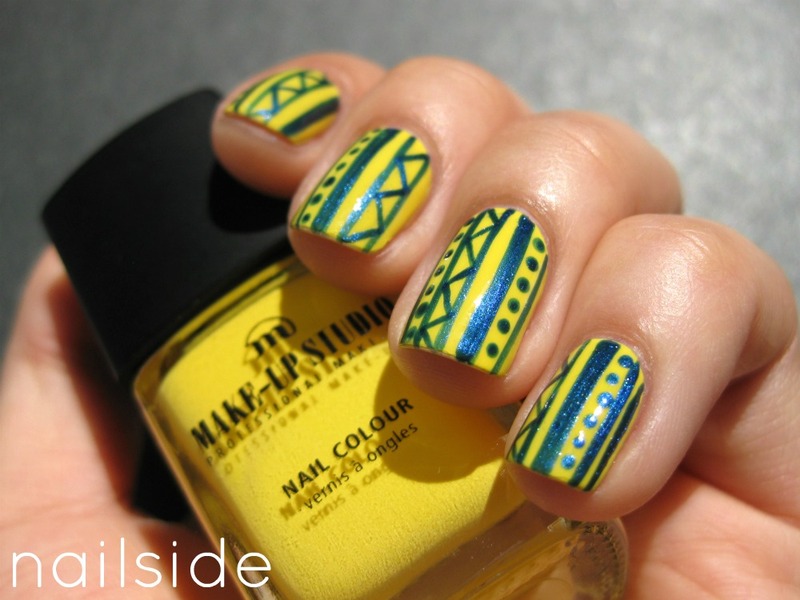 And I like the blue you did the tribal with...the colors go together so nicely! You always combine the most awesome colors! Great job! I like this mani very much! i try to do one next week but i don't realize it perfectly so i don't do all my nails ! but your mani is just perfect ! Prachtig! En zo recht ook, netjes hoor! awesome mani!! love the colours together! I love your metallic blue liner, and how it appears on the yellow base too! Also your stable hand always amaze me :D Love it! Love the shimmer in that blue. Also, I thought I'd let you know, I just published a post linking to your cloud nail art tutorial that I was inspired by! Thanks! Pretty! I like the contrast of the blue against the yellow. I first thought it was stamped! Amazing. I love these nails. Tutorial please! !